Although I have visited California many times, I have only visited once as a photographer. I spent roughly six weeks in this unbelievably diverse state in February and March, 2016, while I was working on a project called the LA River Trek with a friend. While in the state, I visited a number of State and National Parks, and was continually blown away by the beauty and diversity of the third largest state in the country. I went on a Pacific Northwest trip during the summer of 2018, in which I intended only on shooting Oregon, Washington, and Idaho. But, as they often do, my plans changed. I ended up missing Idaho, but got a bit of Northern California thrown into the mix. The coastline in Northern California is spectacular, and although I hadn't planned in advance on visiting False Klamath Cove, this photo that I took there, shortly before sunset, ended up being on of my favorites from the entire trip! Available in the following sizes (Panorama A): 10x20, 12x24, 16x32, 20x40, 24x48, 24x48 Triptych (3 x 24x16), 30x60, 30x60 Triptych (3 x 30x20), 36x72, 36x72 Triptych (3 x 36x24), 40x80, 40x80 Triptych (3 x 40x27), 48x96, 48x96 Triptych (3 x 48x32). 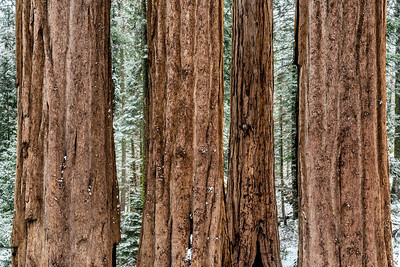 The highlight of a visit to Kings Canyon and Sequoia National Parks, in California's spectacular Sierra Nevada mountain range, must be the giant sequoias, also known as giant redwoods. These trees grow to an average height of 164 to 279 feet, and an average diameter of 20 to 26 feet. They can live for more than 3,000 years. I was lucky enough to visit these giants in April, 2018, and expected spring conditions. I was thrilled (and cold) when it snowed, though, completely transforming the sights available. Available in the following sizes (Rectangle B): 12x8, 18x12, 24x16, 30x20, 36x24, 45x30, 60x40, 72x48. The highlight of a visit to Kings Canyon and Sequoia National Parks, in California's spectacular Sierra Nevada mountain range, must be the giant sequoias, also known as giant redwoods. These trees grow to an average height of 164 to 279 feet, and an average diameter of 20 to 26 feet. They can live for more than 3,000 years. I was lucky enough to visit these giants in April, 2018, and expected spring conditions. I was thrilled (and cold) when it snowed, though, completely transforming the sights available. Available in the following sizes (Panorama B): 30x12, 40x16, 50x20, 50x20 Triptych (3 x 17x20), 60x24, 60x24 Triptych (3 x 20x24), 75x30, 75x30 Triptych (3 x 25x30), 90x36, 90x36 Triptych (3 x 30x36), 105x42 Triptych (3 x 35x42), 120x48 Triptych (3 x 40x48). The highlight of a visit to Kings Canyon and Sequoia National Parks, in California's spectacular Sierra Nevada mountain range, must be the giant sequoias, also known as giant redwoods. These trees grow to an average height of 164 to 279 feet, and an average diameter of 20 to 26 feet. They can live for more than 3,000 years. I was lucky enough to visit these giants in April, 2018, and expected spring conditions. I was thrilled (and cold) when it snowed, though, completely transforming the sights available. Available in the following sizes (Panorama A): 20x10, 24x12, 32x16, 40x20, 48x24, 48x24 Triptych (3 x 16x24), 60x30, 60x30 Triptych (3 x 20x30), 72x36, 72x36 Triptych (3 x 24x36), 80x40, 80x40 Triptych (3 x 27x40), 96x48, 96x48 Triptych (3 x 32x48). Another one of those instances of dumb luck making all the difference in the world. I only had one or two days in Kings Canyon and Sequoia National Parks, in California's Sierra Nevada mountain range. I was there in mid-April, and anticipated spring conditions. Although the unexpected snow made it cold, and made camping that much less comfortable, it was a blessing, overall, since my photos certainly wouldn't have turned out as well if there had been blue skies and green grass. The tree in this photo is the General Grant Tree, in King's Canyon National Park, and it is the second largest tree in the world. It has a diameter of just under 30 feet at its base, and it stretches 267 feet into the air. It's pretty big. Available in the following sizes (Panorama C): 10x30, 12x36, 16x48, 16x48 Triptych (3 x 16x16), 20x60, 20x60 Triptych (3 x 20x20), 24x72, 24x72 Triptych (3 x 24x24), 30x90, 30x90 Triptych (3 x 30x30), 36x108 Triptych (3 x 36x36), 42x126 Triptych (3 x 42x42), 48x144 Triptych (3 x 48x48). Vernal Falls is another Yosemite icon, but it is one that actually requires a bit of a hike to reach. 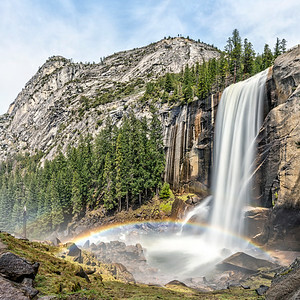 I was lucky to have the weather I did for this hike, because the sunlight was powerful enough to create the rainbow made by the mist generated by Vernal Falls' 318 foot drop. Available in the following sizes (Square): 10x10, 12x12, 16x16, 20x20, 24x24, 30x30, 36x36, 42x42, 48x48. 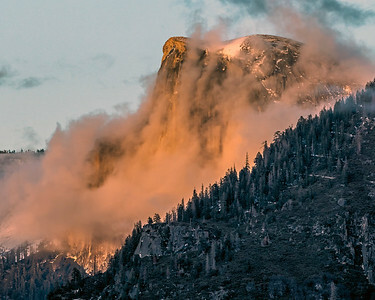 Half Dome is one of Yosemite's most famous icons. I took this photo of Half Dome in the clouds with a telephoto lens as the sun set, seeming to set the mountain's western-facing slope on fire. Available in the following sizes (Rectangle A): 10x8, 14x11, 20x16, 24x20, 30x24, 40x30. 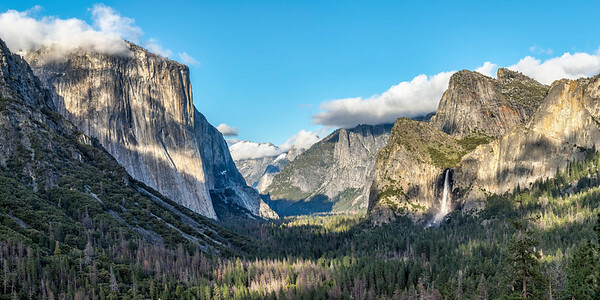 Yosemite's famous “Tunnel View,” featuring, from left to right, El Capitan, Half Dome (partially obscured by clouds), and Bridalveil Falls. Available in the following sizes (Panorama A): 20x10, 24x12, 32x16, 40x20, 48x24, 48x24 Triptych (3 x 16x24), 60x30, 60x30 Triptych (3 x 20x30), 72x36, 72x36 Triptych (3 x 24x36), 80x40, 80x40 Triptych (3 x 27x40), 96x48, 96x48 Triptych (3 x 32x48). Yosemite's famous “Tunnel View,” featuring, from left to right, El Capitan, Half Dome (partially obscured by clouds), and Bridalveil Falls. Available in the following sizes (Rectangle B): 12x8, 18x12, 24x16, 30x20, 36x24, 45x30, 60x40, 72x48. Fern Spring, in Yosemite National Park, is on the side of the road, and is a favorite with local photographers. 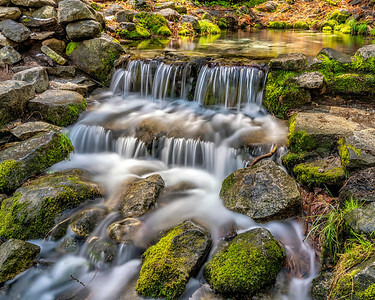 This bubbling spring is so perfect, it is hard to believe it is natural. It really looks designed. The water is unbelievably clear. I took a long-exposure here to give the water the flowing look shown. Available in the following sizes (Rectangle A): 10x8, 14x11, 20x16, 24x20, 30x24, 40x30, 50x40, 60x48. Yosemite National Park is a truly magical place. I was fortunate enough to be here when it snowed, which upped the beauty to eleven. The mountain which is just being kissed by the day's first light in this photo is called the Cathedral, and I love the reflection I was able to get in this photo. Available in the following sizes (Rectangle B): 12x8, 18x12, 24x16, 30x20, 36x24, 45x30, 60x40, 72x48. 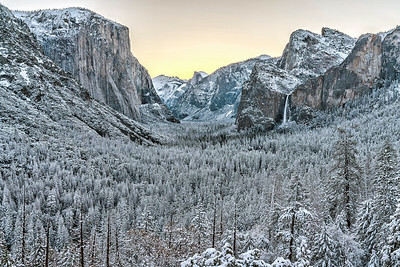 Everyone that goes to Yosemite National Park, in California's Sierra Nevada mountains, is familiar with this scene. Made iconic by Ansel Adams, it even has a name – Tunnel View. 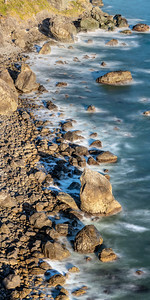 (This location is at the mouth of a tunnel that allows one to access areas of the National Park other than the valley.) 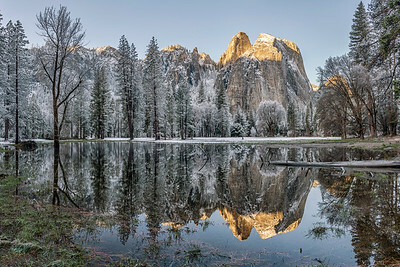 Many of Yosemite's most famous landmarks are visible from this location, including (from left to right), El Capitan, Half Dome, and Bridalveil Falls. While this scene is beautiful at any time of day, seeing it at sunrise after a night in which it had snowed six or so inches was truly special. Available in the following sizes (Panorama A): 20x10, 24x12, 32x16, 40x20, 48x24, 48x24 Triptych (3 x 16x24), 60x30, 60x30 Triptych (3 x 20x30), 72x36, 72x36 Triptych (3 x 24x36), 80x40, 80x40 Triptych (3 x 27x40), 96x48, 96x48 Triptych (3 x 32x48). Everyone that goes to Yosemite National Park, in California's Sierra Nevada mountains, is familiar with this scene. 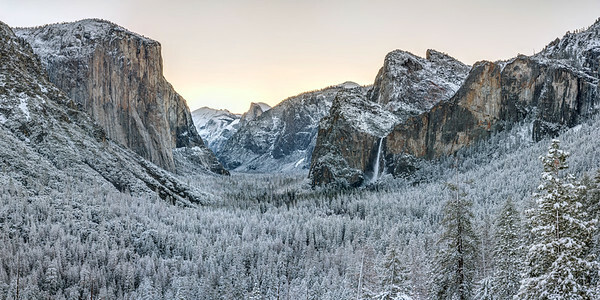 Made iconic by Ansel Adams, it even has a name – Tunnel View. (This location is at the mouth of a tunnel that allows one to access areas of the National Park other than the valley.) 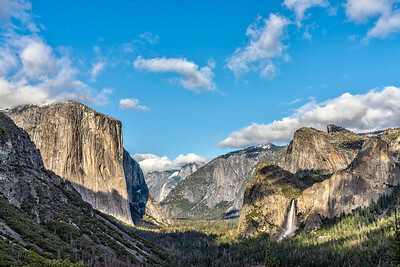 Many of Yosemite's most famous landmarks are visible from this location, including (from left to right), El Capitan, Half Dome, and Bridalveil Falls. While this scene is beautiful at any time of day, seeing it at sunrise after a night in which it had snowed six or so inches was truly special. Available in the following sizes (Rectangle B): 12x8, 18x12, 24x16, 30x20, 36x24, 45x30, 60x40, 72x48. 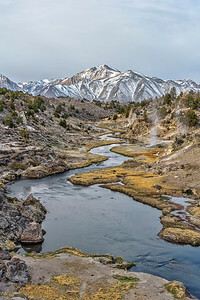 Hot Creek, which lies in the eastern Sierra Nevada mountain range, begins as Mammoth Creek, and is made primarily of snow melt … so it isn't exactly hot. It eventually goes along to join warmer water from geothermal springs at the Hot Creek State Fish Hatchery. Even here, it isn't exactly 'hot,' seldom reaching temperatures higher than 68 degrees, but that's hot enough to justify the name. The way the stream curves back and forth, leading one's eye to what I believe is Sharktooth Peak is composition heaven. Available in the following sizes (Rectangle B): 8x12, 12x18, 16x24, 20x30, 24x36, 30x45, 40x60, 48x72. 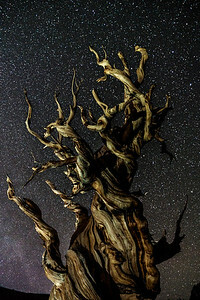 Ancient Bristlecone Pine trees, such as the one shown in this photo, are the longest-living (non-clonal) organisms on the planet. There is a tree in this forest that germinated in 3051 BC. They thrive in high alpine environments, and grow incredibly slowly. There's something magical about walking through a forest of trees that have been growing for literally thousands of years. I took this photo at night, and lit the tree using bounced light from a headlamp. Available in the following sizes (Rectangle B): 8x12, 12x18, 16x24, 20x30, 24x36, 30x45, 40x60. 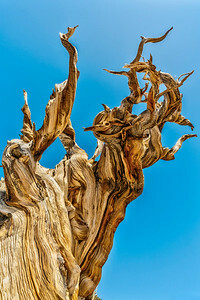 Ancient Bristlecone Pine trees, such as the one shown in this photo, are the longest-living (non-clonal) organisms on the planet. There is a tree in this forest that germinated in 3051 BC. They thrive in high alpine environments, and grow incredibly slowly. There's something magical about walking through a forest of trees that have been growing for literally thousands of years. Available in the following sizes (Rectangle B): 8x12, 12x18, 16x24, 20x30, 24x36, 30x45, 40x60, 48x72. 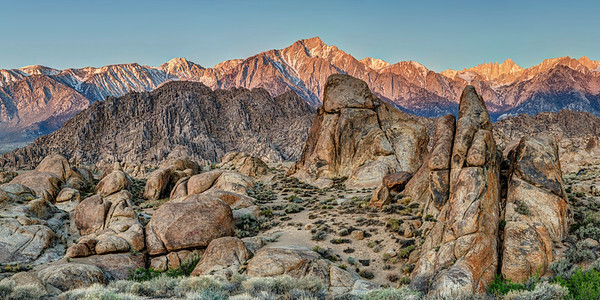 The Alabama Hills, which are part of the Bureau of Land Management (BLM) lands, lie just to the east of the southern portion of the Sierra Nevada mountains. Many TV shows and movies have been filmed or had portions filmed here, including The Lone Ranger, Bonanza, Tremors, and Gladiator. I took this photo here, shortly after sunrise. Mt. Whitney – the tallest mountain in the lower 48 States – can be seen in the upper, right hand corner of the photo. Available in the following sizes (Panorama A): 20x10, 24x12, 32x16, 40x20, 48x24, 48x24 Triptych (3 x 16x24), 60x30, 60x30 Triptych (3 x 20x30), 72x36, 72x36 Triptych (3 x 24x36), 80x40, 80x40 Triptych (3 x 27x40), 96x48, 96x48 Triptych (3 x 32x48). 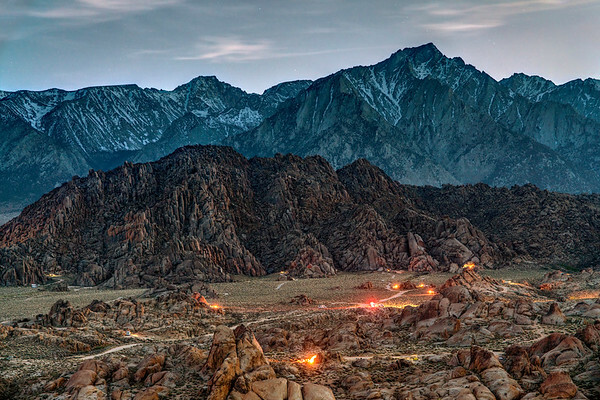 The Alabama Hills, which are part of the Bureau of Land Management (BLM) lands, lie just to the east of the southern portion of the Sierra Nevada mountains. Many TV shows and movies have been filmed or had portions filmed here, including The Lone Ranger, Bonanza, Tremors, and Gladiator. I took this photo here, shortly before sunrise. Mt. Whitney – the tallest mountain in the lower 48 States – can be seen in the upper, right hand corner of the photo. Available in the following sizes (Panorama B): 30x12, 40x16, 50x20, 50x20 Triptych (3 x 17x20), 60x24, 60x24 Triptych (3 x 20x24), 75x30, 75x30 Triptych (3 x 25x30), 90x36, 90x36 Triptych (3 x 30x36), 105x42 Triptych (3 x 35x42), 120x48 Triptych (3 x 40x48). The Alabama Hills, which are part of the Bureau of Land Management (BLM) lands, lie just to the east of the southern portion of the Sierra Nevada mountains. Many TV shows and movies have been filmed or had portions filmed here, including The Lone Ranger, Bonanza, Tremors, and Gladiator. It is also a popular camping spot, as made obvious by all the lights in the foreground of the photo. Available in the following sizes (Rectangle B): 12x8, 18x12, 24x16, 30x20, 36x24, 45x30, 60x40.